Raymond Swanland is one of the artists whose works leave me in amazement every time I see them. I was given another chance last week when Irene Gallo presented the cover artwork for the e-book edition of the 13th novel in “The Wheel of Time” series, “Towers of Midnight”. I am very happy to see that Raymond Swanland is one of the fourteen artists who were commissioned to design the cover books for the electronic editions Tor Books is releasing. 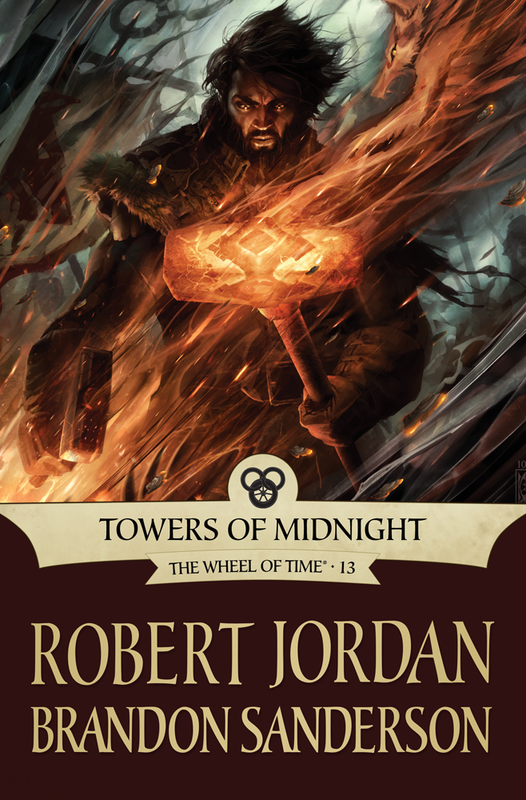 Raymond Swanland is a great artist and this can be easily seen in the artwork he made for Robert Jordan & Brandon Sanderson’s “Towers of Midnight” too. For me this is the best of the cover artworks made for the e-book editions of “The Wheel of Time” series and we saw some great artwork for these novels, because Raymond Swanland gives once again a truly motion sensation to his artwork, he is a true master of this technique, because I love the colors he used, the balance between them and the details of the scene. A top notch artwork, at the highest level of Raymond Swanland’s talent. As usual we can find a very interesting article on Tor.com about the process behind the creation of this artwork. Also here on my blog you can find an interview I made with Raymond Swanland, with whom I had the pleasure to talk a while back. This cover captured the scene where Perin molds his hammer, better than what I had pictured in my mind, when reading the book. The Dragon in the flames, representing the power from the Aasherman and aisedai was genius. In other images of Perin he comes across as a little dorky, but in this image he comes across as a dangerous focused man that has been through a lot. Like forged metal that is now stronger, (a fitting metaphor) this art work has captured his as the leader Parin has chosen to become. Thank you Raymond Swanland. I hope you can take the time to do justice to the other characters as well.